Nong Duc Manh is a famous Politician from Vietnam, he is 78 years old and still alive, born September 11, 1940. Nông Đức Mạnh (born in Cường Lợi, Na Rì, Bắc Kạn, the former French Indochina) was the Vietnamese Communist Party General Secretary. 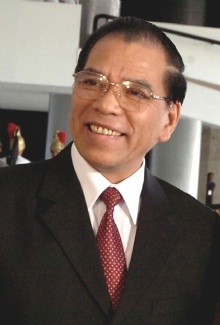 He held this position, which is the most powerful in the Vietnamese government, from 22 April 2001 to 19 January 2011. According to his official biography is Manh son of Tày-farmers, but a rumor claiming that he is actually the son of the North Vietnamese leader Hồ Chí Minh. This reputation is said to be one of the reasons Manh surprise party career. Manh is the father of Nong Quốc Tuan, who is party secretary for Bắc Giang province. He is born under the zodiac virgo, who is known for Analyzing, Practical, Reflective, Observation, Thoughtful. Our collection contains 7 quotes who is written / told by Nong. "In general, everyone wants to work and work more. But in fact, when a young generation has sufficient capability then we should create conditions for them to work"
"As part of our renewal - we need to fight problems, not just wait for them to take place"
"We don't want to keep secrets anymore"
"We cannot but feel uneasy about the losses caused by humanity themselves. Apart from the losses of life and property in destructive wars, the environment and natural resources are also being destroyed by human hands"
"The war against terrorism should not be used to interfere with an independent, sovereign state. We need to identify concrete terrorist targets and do no harm to civilians"
"In Vietnam we have no political prisoners. No one is arrested or jailed for his or her speech or point of view. They are put in jail because they violated the law"